The term Follie or 'us' or 'we' refers to the owner of the website whose registered office is Follie, 83 Bailgate, Lincoln, LN1 3AR. The term 'you' refers to the customer or viewer of our website. 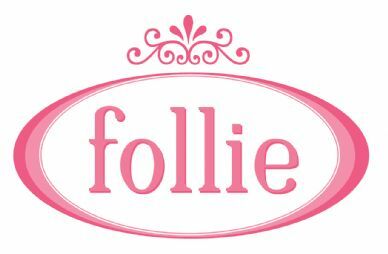 Follie is a private limited company. The company is registered in England and Wales, under company number 5160738. Our VAT registration number is 856659275. You may not create a link to this website from another website or document without Follie’s prior written consent. Our prices are in Pounds Sterling and are inclusive of VAT at 20%. All prices are as accurate as possible, every effort has been taken to ensure no mistakes have been made, if however we find any inaccuracies on the site we reserve the right to amend these errors to the correct prices without prior warning or notice. The information contained in this website is for general information purposes only. The information is provided by Follie and while we endeavour to keep the information up to date and correct, we make no representations or warranties of any kind, express or implied, about the completeness, accuracy, reliability, suitability or availability with respect to the website or the information, products, services, or related graphics contained on the website for any purpose. Any reliance you place on such information is therefore strictly at your own risk. In no event will we be liable for any loss or damage including without limitation, indirect or consequential loss or damage, or any loss or damage whatsoever arising from loss of data or profits arising out of, or in connection with, the use of this website. Through this website you are able to link to other websites which are not under the control of Follie. We have no control over the nature, content and availability of those sites. The inclusion of any links does not necessarily imply a recommendation or endorse the views expressed within them. Every effort is made to keep the website up and running smoothly. However, Follie takes no responsibility for, and will not be liable for, the website being temporarily unavailable due to technical issues beyond our control. Follie is committed to protecting your privacy. None of the information we collect is passed on to other parties, except when required as part of the business services we provide for you, or as required under UK law. We may use your email address to contact you about future offers, but you may unsubscribe from these emails and we will not contact you again. Follie collects information about you for two reasons: firstly to process your order and secondly to provide you with the best possible service. Information collected includes your name and address, your email address, and various other details necessary to complete a transaction and fulfil your order. We do not collect any information which may be deemed "sensitive personal data" under the Data Protection Act 1998. You can check the information that we hold about you by e-mailing us. In the event you find any inaccuracies we will delete or correct them as required. © 2016 Copyright Follie All rights reserved.